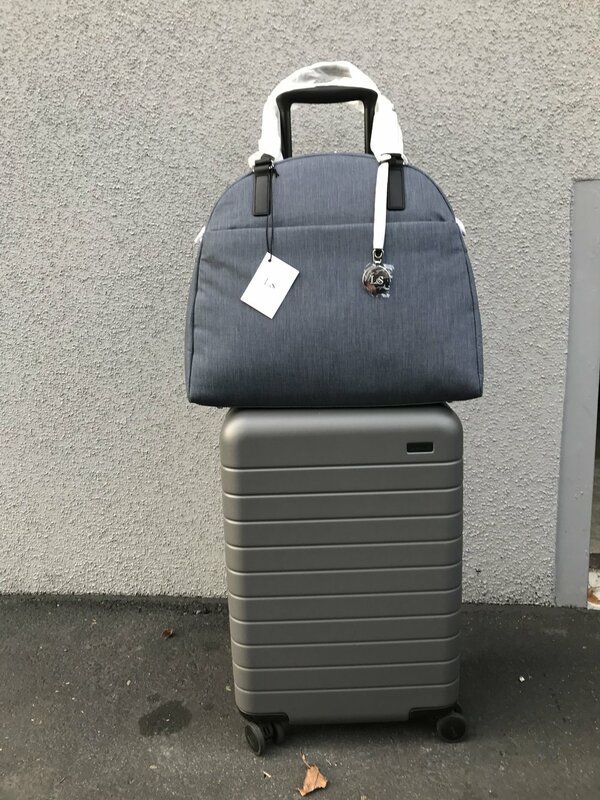 First off I just want to thank readers notsaf and Sarah who commented on my Cuyana Le Sud Travel bag post suggesting trying the Lo & Sons travel bags. I read that and lucky for me Lo & Sons had both their OG overnight bag and their OMG medium overnight bag for sale at 30% off (and actually there are still some colors on sale now) so I got both to see which one I might like better. The OG is the bigger bag on the left and the OMG is the smaller bag in green on the right. I spent a lot of time waffling between the two because I liked the blue color better but the size of the OMG better. I found the OG to be quite gargantuan. And a poll on Instagram had the OMG winning. But in the end I went with the OG because I just had too much stuff for my 10 day trip to Europe. I had to go with the bigger bag and I'm glad I did! This bag can fit a ton of stuff and I definitely needed to. The OG bag really was the perfect carry-on bag to take on a train tour of Europe! I loved that it had a panel to slip over the handlebar of my roller bag. This OG bag never once fell off the top of my luggage, which is not something I can say about the Cuyana Le Sud Travel bag. Also the OG bag is super lightweight and inside there are a ton of pockets for everything you need. The laptop section is nicely padded and there's also an outside zippered pocket that has another zippered compartment and an organizational section for pens and such. They really thought of everything with this bag. 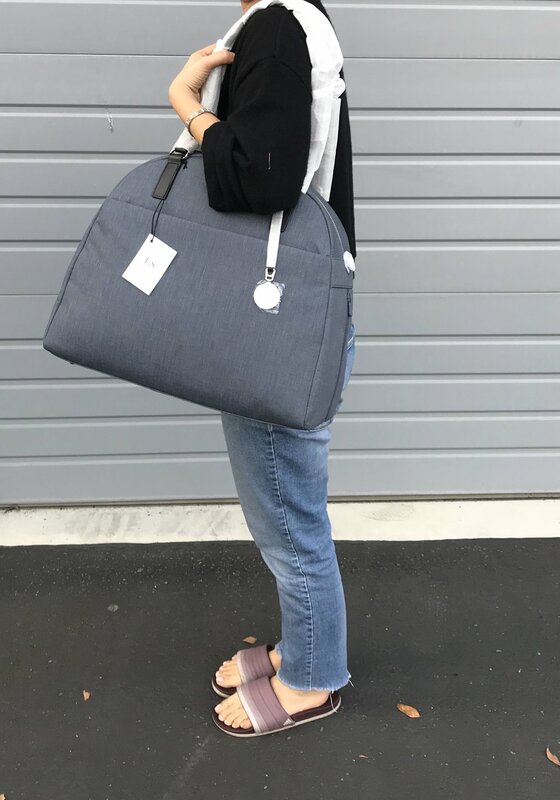 Oh and it also comes with a large shoulder strap but I never used it (and can't imagine trying to carry this humongous bag with a long shoulder strap). For the most part I carried it atop my roller luggage or by the shorter straps that still were able to go over my shoulder. - When the bag is packed to the brim, it's hard to pull the laptop out of the bag. I think it's due to the domed shape of the bag. Also when it's packed to the max, the outside organizational pocket is pretty useless (its impossible to get things in or out). - It's a tad hard to put the bag under the seat in front of you on the airplane with it standing upright since the bag is so tall (and this is especially true when it's packed to the max). Lucky for me I was traveling with my husband so I would lay the bag down and he didn't mind if it went into his foot-space a bit. But I would say that this OG bag is above and beyond better than the Cuyana one for practical traveling. I look forward to taking many a trip with this bag. In the meantime I think I'll try using it as a gym bag since my current one can never seem to hold everything I need.